After reading about a rich heiress who collected dolls and doll houses in Empty Mansions, it seems only fitting that I should read Dolls' Houses from the V&A Museum of Childhood by Halina Pasierbska so closely afterwards. The V&A of the book title refers to the Victoria & Albert Museum, and the V&A Museum of Childhood is a branch of that museum, with both of them located in London. The author Halina Pasierbska was curator of Dolls' Houses and Toys there and in publishing this book is sharing years of knowledge and expertise in the magical world of dolls' houses. There's something special about seeing the objects and furnishings of everyday life shrunken to a miniature size. The detail in replicating a couch, fireplace or cooking pot can be crude or detailed beyond belief, and they are all just begging to be played with. History tells us dolls' houses were used as a teaching aid for servants and children of the household to learn how a house was to be organised and run, so that everyone knew their place and their role in the home. Dolls' houses from centuries ago capture life as it was at the time, and now serve as an historical snapshot into domestic life and the lifestyle of the occupants. 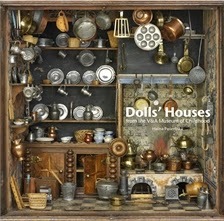 Dolls' Houses from the V&A Museum of Childhood was written to compliment an exhibition at the museum and contains photographs and descriptions for some of the museum's oldest and most precious houses all the way up to the present day. My only complaint reading this book was that there weren't enough photographs for my liking. I really wanted more, and perhaps this interest would only be satiated by being present at the exhibit, but as a reader half a world away, I wanted to gain as much as I could from both the content and the colour photographs. While many children will enjoy 'flicking through' this book, it will really appeal to mature readers, collectors, or wannabe collectors.